There was a lot of nervous laughter at my press screening of Kenneth Lonergan’s Manchester by the Sea. 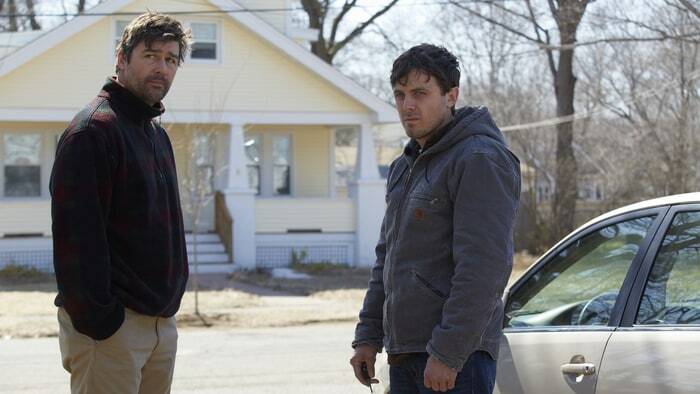 Most of it was there by design; Lonergan deftly injects moments of awkward comedy throughout this devastating character study of Lee Chandler (Casey Affleck), a Boston janitor who returns to his eponymous hometown following the sudden death of his brother Joe (Kyle Chandler). Much of the film occupies the stilted moments in between traditional story beats, the forced niceties with the doctors who tell you your brother is dead, the strained search for your parked car after visiting the funeral home. There’s a fantastic bit where, after a horrific tragedy which I will not spoil, paramedics put Lee’s ex-wife Randi (Michelle Williams) on a stretcher. But as they try to put her in the ambulance, the damned thing keeps malfunctioning. They struggle for a time to hoist her up, failing again and again until Lee has to run over and help. In the hands of a lesser director, this would have been painful slapstick. But here it’s so natural that one can’t help but recognize such absurdities from life itself. But I think some of the laughter was mere self-defense: Manchester by the Sea may be an exploration of Lee’s grief, but in doing so Lonergan holds a mirror up to the audience and forces us to see reflections of the darkest moments of our own lives. To say Manchester by the Sea is emotionally exhausting is laughable—it’s cataclysmic. Seamlessly alternating the action with flashbacks, Lonergan creates a three-dimensional portrait of suffering and loss. Affleck is a revelation: he hasn’t been this wounded, this damaged since his performance in Andrew Dominik's The Assassination of Jesse James by the Coward Robert Ford (2007). Here he displays a raw physicality, his whole body moving and fidgeting as his face remains stoic and stone-like. Here is the kind of acting that made Marlon Brando a legend. The film isn’t perfect. What begins as a character study expands to include Lee’s guardianship of his nephew Patrick (Lucas Hedges). Like Lee, Patrick is on a fast-track towards emotional isolation and detachment. Nowhere is this more apparent than in their common need for lashing out physically. But whereas Lee gets drunk and starts bar-fights with strangers, Patrick takes his emotions out in the hockey rink and in the bedrooms of his two girlfriends. There’s an odd sequence that focuses on Patrick’s disastrous attempts to get to home base with his second girlfriend. Unlike the aforementioned stretcher scene, these scenes are played like slapstick comedy; the girlfriend’s mom repeatedly knocks on their door at inopportune moments, forcing them to scramble to get dressed and pretend like they were doing math homework. Eventually Patrick even enlists Lee to help him score by distracting the girlfriend’s mom. In addition to being tonally at odds with the rest of the film, these scenes relegate Lee to being a background character in his own story. After the screening, Lonergan gave a brief Q&A. I wanted to ask him if these scenes were meant as simple comedic relief or if they demonstrated how Patrick was emotionally distancing himself from the world, but I never got picked to go up to the microphone. But I’ll give Lonergan the benefit of the doubt. Despite my gripes, Manchester by the Sea is paralytic in power. Affleck gives what could be the defining performance of his career. During the Q&A, Lonergan mentioned how originally the film was supposed to star and be directed by Matt Damon. I don’t want to impugn Damon’s considerable talents, but I don’t think he would have been the right fit for this film. He’s simply too pretty. You take a look at Damon’s face and all you see is Hollywood. But Affleck looks like he could very well have lived a hard, blue-collar life full of love and loss. In the world of this film, he’s positively organic. MANCHESTER BY THE SEA plays at the NYFF on October 1,2 and 11. a Q&A with the director follows the screenings on the second and 11th. For tickets and more information go here.